Imagine your event headlined by Sage Francis. How much buzz would booking Sage Francis bring to your event? GTB helps customers Book VIP Shows, Corporate Events, & Private Engagements with top talent for hire. GTB represents clients as they book talent like Sage Francis for their event. Click to start The Event Booking Process with Sage Francis. 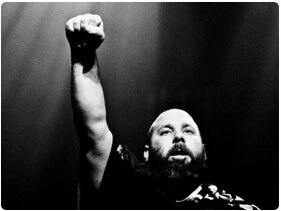 Born Paul Francis in 1977 in Miami, FL, Sage Francis spent most of his youth in Providence, RI. Interested in the poetic side of rap, Francis has been rhyming since age eight, later winning the Superbowl Battle in Boston in 1999 and the Scribble Jam in Cincinnati in 2000 and 2001 (the last under the name of his "metal" alter ego, Xaul Zan). After graduating from Dean College in Massachusetts with an A.A. in communications and from the University of Rhode Island-Kingston with a B.A. in journalism (where he started the now-defunct group Art Official Intelligence), Francis worked on releasing his solo records. Always an outspoken and political rapper and a strict vegetarian, he started the Sick Of series in 2000 on his independent Strange Famous Records with Still Sick...Urine Trouble, and continued with Sick of Waiting Tables (2001), Sick of Waging War (from 2002, and containing the single "Makeshift Patriot," recorded exactly one month after the September 11 attacks on New York), and Sickly Business (2004). He also released one album on Anticon in 2002, Personal Journals, and was signed in 2004 as the first rap artist on Epitaph Records, which issued his highly anticipated A Healthy Distrust in 2005. Two years later he was working with composer/trumpeter Mark Isham on the soundtrack for Pride and Glory starring Edward Norton. Two tracks from these session ended up on Francis' own 2007 full-length, Human the Death Dance. Sage Francis is one half of the Non-Prophets (Joe Beats is the producer and DJ), who first recorded the 12" Drop Bass/Bounce/I Keep Calling on their friend's Emerge Records in 1999. A full-length album on Lax Records, Hope, came out in 2004. Francis is the owner/CEO of the independent hip-hop record label Strange Famous Records. This label first began as a way for Francis to bootleg his unreleased songs in the late 90's and has since evolved into an official enterprise with an expanding roster of like-minded artists.Francis is also part of the contemporary spoken word movement, performing often at poetry events, and blurring the lines between poetry and hip-hop. Francis relationship with the Providence Poetry Slam community (he was on their 1998, 1999 and 2002 national poetry slam teams) led to it being called "The House that Sage Francis Built" From 2000 - 2002, he also DJ-ed for the NYC-Urbana Poetry Slam, a weekly slam series held at the legendary punk rock venue CBGB. In May 2008, Francis represented "stage poetry" in a "Page Meets Stage" event at the Bowery Poetry Club, with Jeffrey McDaniel representing the "page poet." Imagine booking Sage Francis for your next big event or party. Think about the exciting atmosphere you'll create. Picture what booking Sage Francis would bring to your event. Global Talent Booking can help you push that vision forward. Our entertainment agency will work with you to put the right talent in the right situation. We know what it takes to organize events that exceed everyone's expectations. To learn more about booking Sage Francis, please fill out the event inquiry form provided on the site. We'll have an entertainment booking agent contact you immediately. Click for Sage Francis Event Booking. Start booking Sage Francis now! GTB is a celebrity talent booking agency for paid events. We do not handle media requests, or interviews. GTB will not relay messages to Sage Francis or solicit donations on your behalf. While celebrities do donate their time, they will always charge some kind of fee to do any event, project, venue or celebrity appearance. Booking Sage Francis Not Quite Right? We have the entertainer for your Event! Putting together a memorable event isn't easy. Booking Sage Francis certainly raises the profile of your show or event. GTB is ready to help you make the event flawless, so your attendees remember Sage Francis instead of a mix-up. Private Parties, Concerts, Ceremonies, and any other big events require both planning and personnel; Global Talent Booking can help you every step of the way, from booking to advertising a public Sage Francis event. Should you prefer a private Sage Francis showing, Global Talent Booking has the tools, connections, and expertise to help you manage a velvet roped evening, elegantly! Global Talent Booking has worked with exemplary talent for over 15 years. Booking Sage Francis and other world class entertainers is our expertise. From private concerts featuring some of the most famous names in the music industry to corporate events DJed by the best in the industry, we excel at showcasing your image. GTB is ready to help you book your favorite musicians, djs, and celebrity talent; creating memorable entertainment experiences is what we do everyday. Global Talent Booking Agency services help you with event talent booking. Our services include talent scheduling, contract negotiations, marketing/promotions, agent and/or agency interaction, and so much more. We can help you book Sage Francis, advertise a public event or help you manage the guest list. Our event booking services can even include the press work after your Sage Francis event. Global Talent Booking is here to help you mind the details so your event with Sage Francis is `World Class` the first time, each time, and every time. Our entertainment agency will work with you to put the right talent in the right situation world wide. Global Talent Booking is an International talent booking agency. If you are interested in an international Sage Francis event booking, click here to get started. We know what it takes to organize events that exceed everyone's expectations, no matter where they are in the world. We look forward to helping book your`s. Click to Start Booking Sage Francis. Celebrity Talent, like booking Sage Francis, makes all the difference. Contact our Expert Sage Francis Booking Agents. We are ready to help you start coordinating your Sage Francis event immediately.